Please enter the email address you signed up with and we'll send you a password reset link. We have sent the password reset instructions on Kindly follow the instructions in the mail for resetting your password. Disclaimer: By using or accessing the Website, you agree with the Disclaimer without any qualification or limitation. This website is only for the purpose of providing information regarding real estate projects and properties in different geographies. Zricks.com is not a real estate agent or channel partner, Zricks.com is a real estate marketing website registered under ABC Infratech Pvt Ltd. Any information which is being provided on this website is not an advertisement or a solicitation. The information regarding real estate projects and properties provided herein have been collected from publicly available sources, and is yet to be verified as per RERA guidelines. Further, the company has not checked the RERA* registration status of the real estate projects listed herein. The company does not make any representation in regards to the compliances done against these projects. The Websites and all its content are provided with all faults on an "as is" and "as available" basis. Please note that you should make yourself aware about the RERA (Real Estate Regulation Development Act 2016) registration status of the listed real estate projects. You agree to our Terms of Service, Cookie, Privacy and Content Policies. 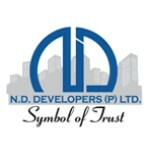 ND Developers Prime listed Property Development Company headquartered in Bangalore, India. Dedicated to land development, construction of residential properties like apartments, villas and commercial complexes. Our expertise in the same can be evaluated in our completed projects which are ranked among the best for both in design, and quality. With over two decades of intensive experience as real estate developers and builders in Bangalore, we have evolved as a company and achieved complete stakeholder satisfaction. Our thorough understanding of the home owners’ fancies and tastes has led to the development of best apartments, luxury villas, and best residential properties in Bangalore. ND developers have to their credit a list of memorable projects which have achieved great customer satisfaction and won accolades which has landed it among the top builders in Bangalore. With highly experienced, dedicated and qualified work force the company is known for its professionalism, integrity, attention to detail, quality of work, architectural design and construction processes. ND Developers are known for both residential properties and commercial properties in Bangalore. Our innovative ideas, customer orientation, modern technology usage, and timely completion of projects have helped us gain client satisfaction. We have completed about ten impressive projects and have a list of upcoming residential and commercial projects in Bangalore. Your query has been submitted! By continuing past this page, you agree to our Terms of Service, Cookie , Privacy, Content Policies, Cancellation and Refund Policy. All trademarks are properties of their respective owners. © 2013-2019 - Zricks™ All rights reserved. Disclaimer: By using or accessing the Website you agree with the Disclaimer without any qualification or limitation. This website is for guidance only. The Company reserves the right to add, alter or delete material from the Website at any time and may, at any time, revise these Terms without notifying you. The contents are being modified in terms of the stipulations / recommendations under the Real Estate Regulation Act, 2016 and Rules made thereunder ("RERA") and accordingly may not be fully in line thereof as of date. n no event will the Company be liable for claim made by the users including seeking any cancellation for any of the inaccuracies in the information provided in this Website, though all efforts have to be made to ensure accuracy. Zricks will help you in finding your dream property. Our Real Estate Experts will assist you in property buying process.